Which PBX systems work with Gradwell SIP trunks? Which PBX systems work with Gradwell IAX trunks? This guide details how to setup an IAX trunk on Elastix. From the Elastix dashboard, click PBX from the top menu bar. Click on Trunks from the left hand menu, and then select Add IAX2 Trunk. Enter the details for your IAX trunk. Only the settings below need to be modified - any other values can be left as default. In the Dialed Number Manipulation Rules section, delete match pattern and enter a period (.) instead. n.b. the username and secret is set by you within the IAX Users section of your Gradwell control panel. 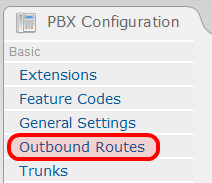 You now need to configure an outbound route so that Elastix uses your trunk when somebody tries to make a call. From the left hand menu, select Outbound Routes. Enter a name for the route and within the Dial Patterns that will use this Route section change match pattern to a period. 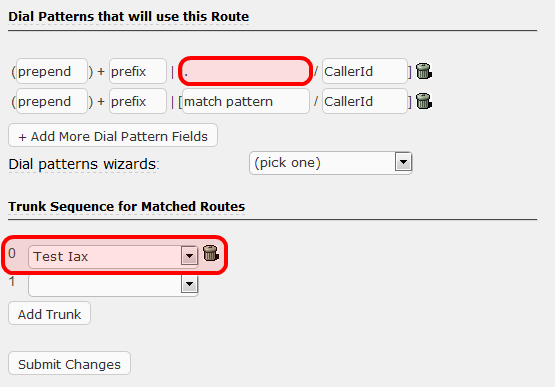 In the Trunk Sequence for Matched Routes section select the trunk you've just created in position zero using the dropdown box. Click Submit Changes to complete the setup.